How can I access your Online Services? You must first obtain a User ID and Password by using our Online Registration Form. Once you have successfully completed the registration process, your request will be sent to an account representative who will then contact you with your account information. Once you have successfully opened an account with us you will then have access to all of our Online Products and Services. Orders placed on our website before 6:00pm EST will ship the following business day. You can also track your order on our website by scrolling over the My Account tab above and clicking Track Your Package. Can I check my sales history? Yes, you can search your sales history after logging in by scrolling over the My Account tab above and clicking Order History. To help protect your account from unauthorized users, we have incorporated a feature that will automatically log you off of our site after 30 minutes of inactivity. We still strongly encourage you to manually logoff and/or close your browser window whenever leaving your computer unattended. The website is not a replacement for your account representative. It is designed to provide a fast and convenient way for you to view our real-time catalog and place orders. The website is available to you 24 hours a day, 7 days a week. There are many valuable services, programs and information only your sales representative can provide. Having a strong relationship with them will ensure you are receiving the best service available. Can I receive transaction data information from your site? Yes you can retrieve transaction data information without logging in, click the transaction data link located on the bottom left side of the home page then enter your account and invoice numbers, you can then print or email your transaction data information. The transaction data will open in a PDF format, if you have a pop-up blocker you will have to disable it before opening the transaction data PDF page. 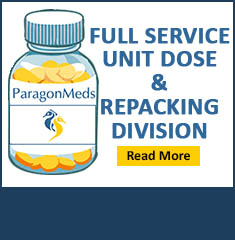 Web support is available via phone at 1-800-758-2955 and via email at: weborder@paragonmeds.com. You may also contact your account representative if necessary. Can I change my internet account information? For security reasons your internet account information can not be edited on line, please contact the help desk for any changes.